The principle of the Iron Triangle in project management states that for any change on one side, one side (or both) must change as well. For example, if we have a limited amount of time to accomplish a task (fixed date), then we either add more cost or reduce scope. 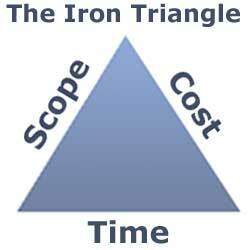 If we need to reduce the cost, we must add time or reduce scope. If we need to keep the scope of work intact, we may need to increase time, cost, or both. Seems simple on paper, but it is hard to manage when reality settles in. So, what is it that your project requires most: time, money, or a specific feature set/scope? That is the driving factor for your project, and a compromise of the other two factors will be required (more time, more money, or reducing features). When planning your project, be sure to understand what the tradeoffs are, and what the priorities are at each milestone. This helps manage expectations with your stakeholders and volunteers as you begin to set your timeline, and also helps manage risk when things happen that you least expect.